1. Start by making the onion bhaji. Place both flours into a bowl, pour in the melted ghee and lemon juice, and mix until well combined. Add 3-4 tbsp water to form a paste. Then add the remaining bhaji ingredients and season with salt. Mix well. Stand to one side for 10 minutes. 2. Meanwhile, combine all the ingredients for the salsa in a bowl, season, and set aside. Repeat in another bowl for the mint yogurt. 3. Preheat the oven to 180°C, gas mark 4. To cook the bhajis, place a large flat frying pan over medium heat. Add a little oil to cover the bottom of the pan. Divide the mix into 4. Spoon a round shape about the size of a burger and 1cm thick into the hot pan. Leave until it is caramelised and the mix has dried slightly. Then turn over to caramelise the other side. Continue cooking on a medium heat for about 10-15 minutes, or until golden and the onions are cooked through. 4. 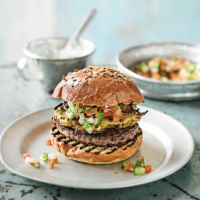 To serve, brush the top of the burger buns with a little egg wash. Sprinkle on some coriander seeds and place in the preheated oven for a few minutes or until the seeds adhere to the bun. Cook the burgers according to the pack instructions. 5. Place the burger on the bottom half of the brioche bun. Place the onion bhaji on top. Add some of the salsa. Finish by drizzling over some of the mint yogurt. 6. Serve with triple-cooked chips (see recipe) finished with a little curry salt (10g fine salt mixed with ¼ tsp toasted curry powder).